The best source of information you can use to create a transaction coding rule is gathered from the bank transaction itself. 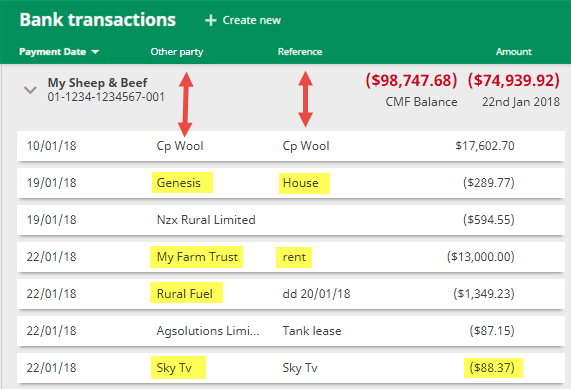 Once a rule has been created, Cash Manager Focus searches for and recognises text in your transaction that matches a coding rule, and automatically codes it for you. Tom and Beth pay a monthly rental to their Trust. There are also irregular payments for other items throughout the year that are paid to and from the Trust. So that the correct code is allocated to the monthly rental payments, they create a transaction coding rule, as follows, using two of the four available criteria. 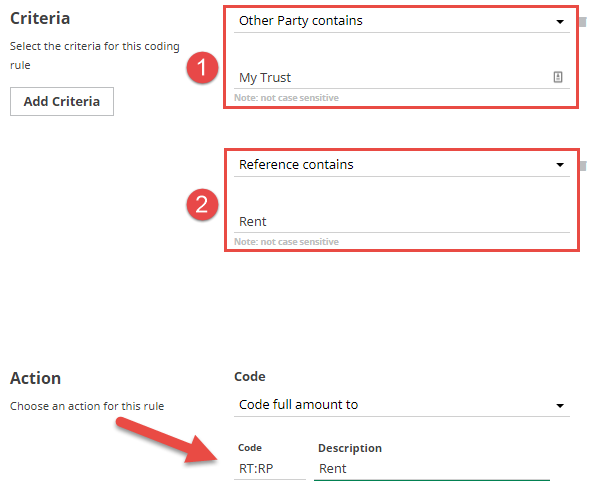 Because Tom and Beth have created a rule with two criteria, only bank transactions that contain the other party My Trust and the reference Rent will be automatically coded to the category code Rent (RT). Click on Settings from the main menu and then Codes. Click on Transaction coding rules. Set the first criteria as shown below (1). To add an additional criteria, click on Add Criteria. Additional criteria will appear in the list as below (2). if there is a percentage split of the transaction amount i.e. a split between business GST and personal use. Once you have created the coding rule, click Save.